Paula has been baking since she needed to stand on a chair to reach her mother’s kitchen table. Every Saturday morning was devoted to baking cookies, pies, kuchens, and more. Very few store-bought pastries ever entered the house. Her love of cooking led her to the Culinary Institute of America from which she graduated in 1985. 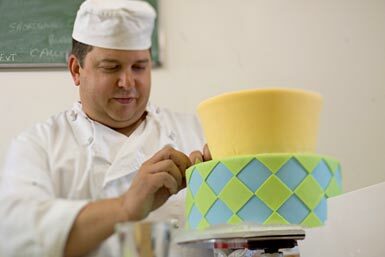 Paula then spent several years in the pastry departments of four- and five-star hotels, including the Peabody in Memphis, Tennessee, and the Ritz Carlton in Laguna Nigel, California. or by email at premierpastry@msn.com. Cake consultations by appointment. We may not be available if you stop by, either because we're already meeting with someone or busy finishing up orders on deadline.